“Isn’t it kind of amazing that a song that was made popular in the 1940’s would still be so well known that it could be the source of a joke for a t-shirt company in 2011? It seems like most of us can remember a time when “You put your right hand in, you put your right hand out…” I guess it’s all that repetition; there’s nothing new, so we don’t have too much trouble going through the motions. At the beginning of this parable, a teacher of the law, a man who has devoted his life to learning and observing Jewish law, asks Jesus, “What must I do to inherit eternal life?” I think it’s safe to assume that this guy wasn’t asking Jesus this question because he didn’t know. He was asking Jesus this question to test him. To see if Jesus’s answer lined up with what he thought he already understood. Think about that last line: “Do this and you will live”. By making this statement to the teacher of the law, Jesus is essentially telling him that he’s not currently loving God and loving his neighbor. He’s telling him he may know the the greatest commandment, but he’s not keeping it. As I read this passage, I’m thinking that this guy is pretty put out with Jesus. Who does this guy think he is telling me I’m not living right? “One particular stretch was ideal for an ambush, and was actually referred to as the “Way of Blood,” because of the number of people who were robbed and killed there. Having a character fall victim to robbers was really a pretty realistic scenario. So as the man lies bleeding and half dead, a priest comes along, and at some point after him, a Levite does too. Again, this was a realistic scenario. They were both travelling the same way as the man who got robbed, which meant they were likely on their way home from working at the temple, which was in Jerusalem. Jericho was sort of a “bedroom community” of Jerusalem and many of the priests and Levites lived there. For some reason, neither of these men stopped to help the victim. It’s easy for us to call these guys names and write them off as callous, uncaring, pompous hypocrites. But before we do, let me ask you: have you ever passed by an opportunity to show compassion to someone else? Not just that person on I-10 with a flat. Maybe a co-worker who you know has had a horrible day (or week or month). You can tell they really need someone, but you’re just so tired. Or you’ve got to get to that meeting. Or you just have to get home. Remember: this trip was about 17 miles, and probably took around 5+ hours to walk. How about at home? You know that your husband, or wife, or kiddo really wants to talk, or play that game with you, or go do that thing with you that they’ve been telling you about for days or weeks. But you just got home. Or you really wanted to go work out tonight. Or you’re wiped and you just want a little down time. At this point in the story, along comes a Samaritan man. By the time of this parable, the Jews considered the Samaritan nation completely impure and lower than dogs. And yet, Jesus chooses a Samaritan to be the hero of the story. I. First, the Samaritan was PROACTIVE. 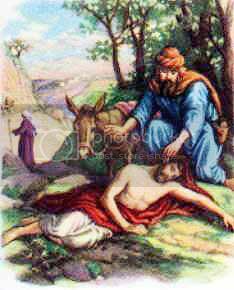 As soon as he saw the victimized man, the Samaritan felt pity and went to him. He engaged the man where he was, without hesitation. II. Second, the Samaritan got MESSY. He jumped right into the ugliness of the man’s situation. People didn’t carry around first aid kits, so I imagine that he had to tear up some of his own clothing for bandages. As he began to bandage the man’s wounds, the wine and the oil that was poured out would have mixed with the dirt and the blood and it would have been messy. III. Finally, the Samaritan GAVE of HIMSELF. him that night. As he prepared to leave the next day, he didn’t surrender his involvement. Instead, he gave the innkeeper two silver coins—two Denari—which would have covered the victims care for about three weeks. And he assured him that if there were more costs involved in the man’s recovery, he would pay for them upon his return. So what can we learn from this parable today? I think a lot of people would say that this story teaches us how to love our neighbor, right? Well, the Samaritan is certainly an amazing example of that very thing. But we’ll miss the big point unless we remember one very important thing: The lawyer’s original question. He asked Jesus, “What must I DO to inherit eternal life?” The lawyer wanted Jesus to tell him exactly who his neighbor was because he was trying to be made righteous by his own actions. In response, Jesus tells him that essentially, his “neighbor” is EVERYONE. Don’t move on too quickly from this idea, because it’s not as clear and tidy as we sometimes want to make it. Think of actually responding to EVERYONE the way the Samaritan responded to the victim. You must be proactive with every single person in your life! Everyone you meet must be a grade A, number 1, top priority for you. You must jump into the mess of EVERYONE you know. Bandaging their wounds, addressing their hurts. You must be committed to their complete and total healing. Finally, you must give of yourself sacrificially to EVERYBODY. Physically, emotionally financially, you give until it hurts. To every single person you come in contact with. 1As for you, you were dead in your transgressions and sins, 2in which you used to live when you followed the ways of this world and of the ruler of the kingdom of the air, the spirit who is now at work in those who are disobedient. 3All of us also lived among them at one time, gratifying the cravings of our sinful nature and following its desires and thoughts. Like the rest, we were by nature objects of wrath. 4But because of his great love for us, God, who is rich in mercy, 5made us alive with Christ even when we were dead in transgressions—it is by grace you have been saved. 6And God raised us up with Christ and seated us with him in the heavenly realms in Christ Jesus, 7in order that in the coming ages he might show the incomparable riches of his grace, expressed in his kindness to us in Christ Jesus. 8For it is by grace you have been saved, through faith—and this not from yourselves, it is the gift of God—9not by works, so that no one can boast. 10For we are God’s workmanship, created in Christ Jesus to do good works, which God prepared in advance for us to do. Now THAT’S what it’s all about. Looking at this parable with a new perspective completely blew me away. How many times have you heard or read this story? The obvious lesson is to love your neighbor, to give sacrificially, etc. I’m not the teacher of the law in this story. Jesus is The Good Samaritan. My friend and pastor Jeff Hogan graciously allowed me to pilfer this post from his blog, Convergence. I should probably tell you he wrote this post while he was still living in Ohio, as we don’t get much snow here in southeast Texas. He’s not blogging much anymore, as he’s busy pastoring Convergence Christian Church. Which has a wicked AWESOME website, in case you haven’t seen it yet. Okay, I’ll admit it: I like snow once or twice a season (it’s a plus when it happens the way I described it above) but after that, I’m really just waiting for Spring. So, I guess it would be more accurate to say that I’d like to visit a place where it snows- see it, play in it- and then go home. I am anxiously waiting for Spring. 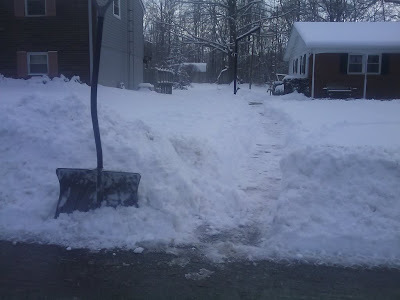 But while it is very true that I don’t think there should be any more snow this Winter, it’s also true that I’m not even remotely equipped to make that decision. And, come to think of it, I’m also not equipped to talk about what is “fair.” After all, there are several things about life that aren’t “fair,” (particularly in the area of God and eternity) in which I am relieved that I don’t have to get what I deserve. Besides, denial and self-pity won’t get the cars and porch cleaned off or the sidewalks shoveled. The only response which accomplishes that result is action. So even though I’m still waiting on the Spring, I got dressed and got to it, remembering that Winter doesn’t last forever. But in that brief moment, it wasn’t an easy choice, even though I clearly knew it was right. Precisely because I’m waiting for it, the big snow seemed to somehow make Spring more implausible- as if it might not actually happen. It was temporarily defeating. Waiting seems to trigger a unique combination of thoughts, emotions, and physiological effects in most people- especially when the wait is ongoing. Waiting tires us out and wears us down. When our emotional batteries get drained, our judgement can be compromised. I believe that more than a few poor choices have been made out of a desire to end the waiting and find closure. In order to avoid this situation, we need to find a source of renewal; a way to keep our stamina while things are on hold. Waiting is a theme that is literally found throughout the entire Bible. Jacob waited seven years to be allowed to marry Rachel, only to be tricked by his father-in-law Laban into marrying her older sister. After re-negotiating for Rachel’s hand in marriage, Jacob worked an additional seven years for Laban (Gen. 29:16-30). At the age of seventy-five, God promised Abraham (then called Abram) that he would be “a great nation” (Gen. 12:2). After receiving that promise, Abraham waited twenty-five more years until God gave him a son, Isaac, through his wife Sarah. In each of these examples, they chose to act while they waited. Jacob negotiated for Rachel’s hand in marriage, and then continued to work for Laban until the terms of that agreement were met. Abraham trusted God’s promise that he would be a great nation, so he left his country and set out on a journey to a new land. The apostles returned to Jerusalem, joined together in prayer and chose someone to take the place of Judas. So where did they find the stamina to do those things? Interestingly, sometimes “wait” in v.31 is translated “hope.” These verses, compare Israel with a person waiting for some kind of resolution. In frustration, the cry goes out, “I’m so tired of this! Don’t you see me God? This isn’t fair!” But, they are reminded that God does indeed see everything, and he never gets tired. And they will find the strength and renewal they need to endure the waiting if they will put their trust and hope in Him. Life is full of waiting, for both the mundane and the very serious. Waiting to check out. Waiting for lunch time. Waiting for that file to download. Waiting for the light to turn green. Waiting to find out if you got the job. Waiting for those test results. Waiting to see if the surgery was a success. It’s likely that you are waiting on something right now. It may be wearing you down and draining your strength. I’ve been thinking about the launch of C3 and the relaunching of Jason’s Church, Breakthrough Church quite a bit lately. I think Jeff and Jason have similar visions for their respective churches. That is, they really do want to get out of the way and allow God to use them for His glory. I know Jeff well enough to know that he doesn’t say that because that’s what he supposed to say. He really believes it. And while I only know Jason through our blogs, I believe that he really believes that, too. I hear much about doing big things for God; of pursuing excellence for Him. Without question, He is worthy of our very best. But often I wonder if we pursue lofty goals in His name because we think that’s what He wants from us. I also wonder if we feel we somehow fail Him when our expectations or the perceived expectations of others fail to materialize. I love Peter’s reaction to the Transfiguration of Jesus in the above passage of scripture. Peter loved Jesus. He wanted to honor him; to do something big for him. He wasn’t wrong for wanting to do this, he just didn’t grasp what was happening. Peter thoughts were likely, “What a great honor for Jesus to be in the company of Moses and Elijah!” Peter didn’t realize that it was Moses and Elijah that were honored to be in the presence of Jesus. When God says, “This is my Son, whom I love; with him I am well pleased. Listen to him!”, do you ever wonder if God is maybe rolling his eyes at Peter — I mean, just a little bit? My point is, I think the Church (big C) needs to prayerfully consider everything we do for His Kingdom. If God wants a church to have thousands of members and offer many ministries and reach a large number of people, He will provide the means to accomplish that. Conversely, if God brings a body of believers together that may only ever have a small congregation, but this church is able to accomplish things that are big in God’s eyes but not big in the eyes of the world, can we be okay with that? Can we also put aside the notion that one is good and the other is bad? I don’t know what God has in store for my little church plant or for any of yours, but I pray that we will have an open dialogue with Him, so that where He leads we will follow. I want God to be enough for you and for me and for all of us. So, it seems that the Esteemed Reverend Hogan is hassling me for reposting some of my older posts. So instead of doing another “best of HLAC”(? ), I have decided to link Jeff’s newest post, Everyday. Which surprisingly, has absolutely nothing to do with Sly and the Family Stone. But you gotta admit, Jeff’s picture on the sidebar of my blog bears a striking resemblance to Mr. Family Stone. If you happen to be new to HLAC, please feel free to express to Jeff how much you are enjoying reading some of my older posts. He will probably dig that. P.S. – That’s some pretty stellar camera work in that video, huh? P. P. S. – “And so on, and so on, and Scooby Doobie Doobie! Ahhhh! Sha Sha!” They just don’t write ’em like that anymore do they? I know many have been praying for our launch, so I wanted to begin by expressing how very grateful we are for your prayers. When we got into our “prayer huddle” this morning, we prayed specifically for Jason’s church and I silently prayed for so many of my amazing friends that I have met through this medium. Launching on Easter Sunday was an almost overwhelmingly emotional experience for me. It was probably good timing. It really drove home why we’re doing what we’re doing in the first place. Here’s an interesting statistic that Jeff sited several weeks ago: Eighty-two percent of people that get a personal invitation to visit a church from a friend, neighbor or co-worker will respond positively to that invitation. I mentioned in an earlier post that C3 has decided not to pursue advertising right now. We’re not against advertising, we just feel that the money put towards getting our name out would be better spent in outreach and missions. The best, most effective advertising (for us, anyway) is someone who is genuinely excited about how God is moving in the life of our church; someone who cares enough about a friend, neighbor or co-worker to want to share that experience with them. Did our launch day exceed our expectations? That’s an impossible question to answer because we had absolutely no idea what to expect. But I will share a personal example of inviting a friend to church. Before Ron and I were married, he introduced me to a couple that were his closest friends, who quickly became my closest friends as well. We did everything with them. It was rare that a week passed without getting together with them for dinner or just to hang out. This relationship continued after we were married. After the birth of our first child, we found a church home and became very involved in several ministries there. It was a wonderful experience that I don’t regret, but because there were so many meetings and events centered around the church, we never seemed to have a free weekend to spend with our dear friends. We were so involved in ministry that we neglected to minister to our friends. Our friends were at our first Sunday today, along with their daughter and one of her friends. We’re getting together with them in a couple of weeks. I don’t know if they will become members of our church, but I do know how much it meant to Ron and me that they were there on such a special day, and I want to honor their friendship by making time to share our lives with them. Last Sunday, one of our core members invited a little girl from her neighborhood to church. She was so excited about being in church. She was asking, “Do you guys meet every week? Do you meet in the summertime?” If that wasn’t blessing enough, this week she showed up with her mom and seven other kids ranging in age from 4 to 14. We had an Easter egg hunt right after church today. It was pouring down raining outside, so we held it in the school cafeteria. (Having a core group member that happens to be the principal of the school you’re meeting in definitely has it advantages!) Anyway, I was looking at the group picture of all the kids with their bags full of eggs, and it occurred to me that a) 5 of our kids were missing (divorced parents – not their weekend) and b) of the 14 kids in that picture, only 5 of them belonged to members of the church. That was such a cool “ah-ha” moment for me. We had several visitors today. I don’t know if they will be back. What I do know is that every single visitor we had was there because someone extended a personal invitation. We’re certainly not going to make any of the megachurches in the area nervous anytime soon, but that’s okay with us. It was a very good day. I was thinking about my blogger pal Koffijah’s post, The Jesus Program this morning. Check it out. It’s really good. And if you’re reading this Koffijah, you’re still off my Christmas card list. Thanks again for all your prayers, I felt so connected to the Church (big “C”) this morning. Now, if you’ll excuse me, there’s a Deadliest Catch marathon calling my name. Incidentally, if you happen to have my phone number, don’t even think about calling me on Tuesday night at 8:00 p.m. central time. It’s the season premiere, and Ron and I are gonna be all up in that! And yes, I’ve used the comments section of other blogs to be silly, but what can I say? I am what I am. I’ll have you all know that I once went almost 3 days without a sarcastic remark. Granted, I was in labor, and I guess I blew it there towards the end when I may have threatened to stab my doctor with a scalpel if she didn’t wheel me into the OR and perform a C-section. But for me, that’s fairly impressive. I’m still feeling a bit reflective, but I want to lighten things up a bit. In keeping with my theme of the week, I wanted to talk a little about official versus unofficial monikers for a church. Zeke, in my opinion, is stand alone cool. But he’s not just a mascot. He represents the Church – one body with many parts. 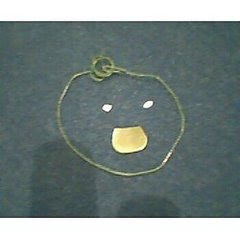 For a detailed look at what this cute little dude represents, you can check out my post, The Building of Christ? I don’t mean to brag, but we have some incredibly gifted, talented and creative peeps at C3. One in particular who has used her award winning graphic design and marketing skills to make a somewhat sad little stick figure (no offense, Jeff) on a piece of paper come to life. Now, when I say “come to life”, I mean that in a literal sense. This little dude will be animated! It’s going to be so flippin’ sweet! I won’t mention her by name, but feel free to post a comment, D.
Zeke has been in some fairly impressive company. He has traveled to Nigeria to visit my friend Mare. He has also had his picture taken with Jon Acuff, Pete Wilson, Anne Jackson, Carlos Whittaker, Brad Lomenick (that bald guy from Catalyst), and Steph at the Red Clay Diaries – just to name a few. Look for him soon on a Facebook Page near you. But Pickboy is a special little guy because he represents the earliest beginnings of C3 at a time when we didn’t even know there would be a C3. A time when the earliest founding members sensed a connection with one another that went deeper than friendship; a glimpse of true fellowship. Don’t worry, Pickboy! We still love you! Well, I’ve rambled on long enough for today. My next post will either be about Official versus Unofficial Slogans! or I will rant incessantly about something in my trademark, completely objective manner. I’ve been watching the news on and off all week, so I’m leaning heavily towards the latter. Plus, I really liked my last incessant ranting post, especially the comments section. It was like I was giving everyone the gift of going second. And I’m generous like that. Could I HAVE any more hyperlinks in one blog post? Before I go any further, I want to clarify something. Almost without exception, every quote I have ever heard or read attributed to Gene Simmons would fit into the category of “Things that make you go Eweh!” But this one is really good. ‘We’re not here for the people that aren’t here, we’re here for the people who are’. This Easter Sunday, and every gathering thereafter, when we meet together to worship God, pray and fellowship with one another, can we simply remember that thought? Thank you so much for your prayers and encouragement. I can’t express how much our little ragamuffin body of believers appreciate you all. You da bomb. Easter Sunday will mark the first time C3 opens to the public; our “launch” if you will. I’m feeling a bit reflective at the moment, and I feel the need to warn you that this week may not be filled with my usual ridiculousness. This may change, but for now, I’m just not feeling it. The sun was shining, and I was surprised at how warm I was getting. It was not particularly hot, but my load was heavy and awkward. About halfway up the hill, we paused for a moment on the gravel road and I turned to take in the view behind me. Looking out past miles of pasture and grassland, my eyes met the horizon and fixed on the mountains that stretched out as far as I could see in either direction. Turning back to our burdens, we started again up the hill. When we had gone as far as the road could take us, we negotiated a small culvert and continued on across country. The buckets made it difficult to traverse the steep incline of the hill, but by now the destination was only a few minutes away. As we neared the top of the bluff, I thought about the objects I was transporting. Every new rock made the lesson sink in more deeply. My final selection was unique. It was a wound that I had carried around for a very long time. No, it was actually several wounds that were all joined together with the common thread of one relationship. I knew it as soon as I saw it. Large, angular and sharp, this rock was as awkward and unattractive as the hurt that it represented. “That thing doesn’t even fit right in your bucket,” Tamara said. “Are you sure you want to carry it all the way up the hill?” She was right. This one rock was as heavy as all the others combined. And since the diameter of my 5 gallon bucket wouldn’t accept all of the lopsided mass, adding it made the whole load awkward and top-heavy. But that was precisely the point. I didn’t want to carry its weight, but I already was. It was perfect. We arrived at the top of the bluff, set our buckets down, and peered over the edge of the cliff. The path we followed on our ascent had circled around so that we could see the mountains again. We could also see where we had begun. Ironically, although we now stood 40-50 feet above it, we really weren’t too far away from our starting point. Had we not been carrying the stones, we could easily have made the same journey in less than half the time. We just stood silently for a few minutes, looking at the mountains and enjoying the cool October breeze. Then one by one, we took turns throwing our rocks off the cliff. With each toss, we expressed to God that we had forgiven the one who hurt us so deeply, and surrendered the burden of the wound to Him. When I got to my last rock- the big one- I stopped and prayed, “Lord, I’ve carried this burden around for so long that it feels like a part me. But I don’t want it, and I never did. I am surrendering everything about the situation to You, including the person. After hurling it over the side, I watched as my rock landed on an even larger one at the bottom of the cliff and was broken. When we can’t forgive, we load ourselves down with burdens that can be much heavier than a bucket full of big rocks. If you’re carrying a weight like this around, take it to the cross and let it go. Life is better with an empty bucket. Near the end of the service, Jeff asked all of us to fill in a blank at the bottom of our sermon notes, tear it off, wad it up and throw it in the trash. Forgiving others, while sometimes difficult, pales in comparison when faced with the daunting task of forgiving myself. But shame is not humility, it is pride. (In my case, anyway.) Satan delights in pride — especially when the children of God dress it up as something holy and righteous. Do you have a stack of papers weighing you down? May I suggest that you wad them up and lay them at the foot of the cross? Forgive. If you are in the Houston area, are looking for a church home, and would like to come “dig our groovy mojo” (sorry – inside joke) please contact Jeff at jeffh@loveliveserve.org. You can also send me an email at katdishrich@gmail.com. We’re freaks, but we’re friendly, people and Jesus loving freaks — promise! Our Lord replies in effect, that abandonment is for Himself, and not for what the disciples themselves will get from it. Beware of an abandonment which has the commercial spirit in it – “I am going to give myself to God because I want to be delivered from sin, because I want to be made holy.” All that is the result of being right with God, but that spirit is not of the essential nature of Christianity. Abandonment is not for anything at all. We have got so commercialized that we only go to God for something from Him, and not for Himself. 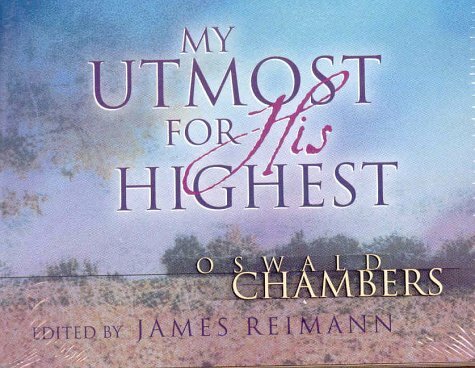 It is like saying, “No, Lord, I don’t want Thee, I want myself; but I want myself clean and filled with the Holy Ghost; I want to be put in Thy show room and be able to say – ‘This is what God has done for me. '” If we only give up something to God because we want more back, there is nothing of the Holy Spirit in our abandonment; it is miserable commercial self-interest. That we gain heaven, that we are delivered from sin, that we are made useful to God – these things never enter as considerations into real abandonment, which is a personal sovereign preference for Jesus Christ Himself. The test of abandonment is always over the neck of natural devotion. Go over it, and God’s own abandonment will embrace all those you had to hurt in abandoning. Beware of stopping short of abandonment to God. Most of us know abandonment in vision only. That dude cuts to the chase pretty consistently. I love that. C3 starts meeting at Memorial Parkway Junior High tomorrow (ur, uh…today). I have seriously loved having church at our home, but we’re busting at the seams, and it’s time. Would you please pray that we would always be ready and willing to Love, Live and Serve in the direction or directions He would have us go? That would be awesome.